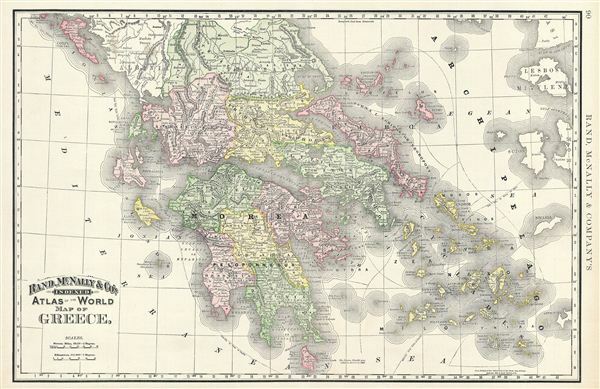 This is a beautiful example of Rand McNally and Company's 1892 map of Greece. It covers from Corfu to Cythera and includes the Cyclades. Although Greece gained independence from the Ottoman empire in 1832 under the Treaty of Constantinople, it would go on to wage war against the empire in 1897 for control over Crete. The Greeks lost the war and some border territories. The intervention of the great powers, however led to Cretan independence and its subsequent consolidation with Greece in 1908. Color coded according to regions and territories, the map notes several towns, cities, rivers and various other topographical details with relief shown by hachure. This map was issued as plate no. 90 in the 1895 issue of Rand McNally and Company's Indexed Atlas of the World - possibly the finest atlas Rand McNally ever issued. Rumsey 3565.022 (1897 edition). Philip (atlases) 1026 (1898 edition).